NOTE: I sold this pet awhile back, but if you have questions feel free to ask since I am pretty knowledgeable about Gyaoppis. This is a multi-pet. Meaning you can choose from 9 different animals to play with. Each animal has a different growth process and eats a different food. The games they play are all the same though and every other feature is the same as well, no matter which character you choose. 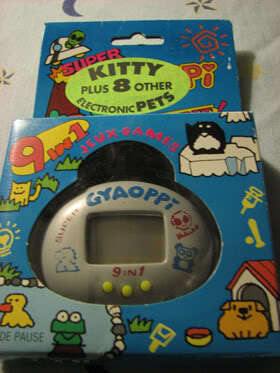 I liked the fact that this virtual pet had an alarm clock on it. Also, if you hold down all three buttons you can see a history of all the animals you have ever raised and what age they passed away at. Very interesting. It also has a sleep meter. It actually fills up depending on how much sleep the animal gets. You can put the animal to bed anytime. It mostly goes to sleep at night though. The Beeping is very light and not as annoying as most virtual pets. The screen is big too. An odd thing about this pet is that instead of showing poops and sickness skulls next to the animal, it instead shows little icons up and down the sides to alert you. I enjoy this one a lot! I give it a 9 out of ten based on features and options. I think they could have designed the shell a bit cuter, though. I think I may have purchased this one online for about $10 a long, long time ago. I just recently bought another blue one for $25. At one point I saw these pets selling for $40 and they are also rare, so I wouldn't count on seeing them on eBay often. I would say anything around $30 or less is appropriate. Get them now because they are going up in value. Growth charts can be found on this here.